When the strong winds knocked a hole in the roof of this Bel Air home, stored objects in the attic bounced around and broke the ceiling. 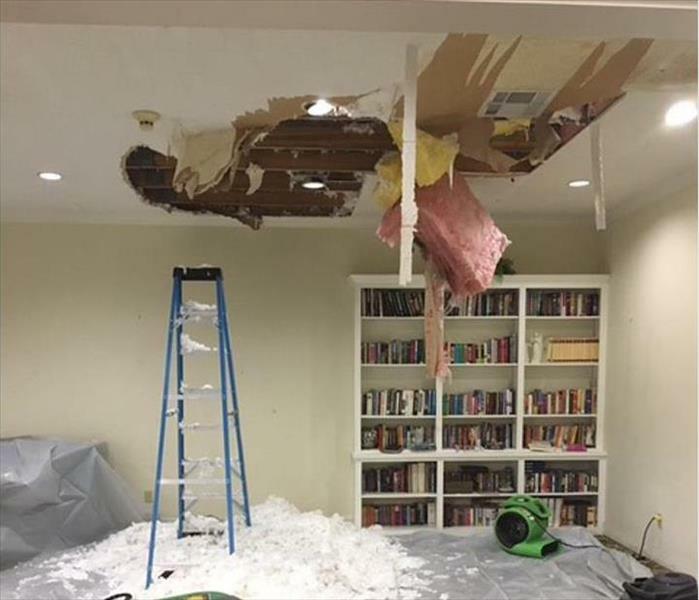 No water, but a mess from the insulation and the safety hazard meant a swift call to SERVPRO for a cleanup and to eventually repair the damaged ceiling. We are a one-stop shopping team--clean it up and fix it up. If your Bel Air home experiences a mold damage disaster our crew can help. SERVPRO of Bel Air / West Hollywood is locally owned and operated, ready 24/7, and Faster to Any Size Disaster. We have the equipment, training, and experience to restore your home to pre-damage condition. 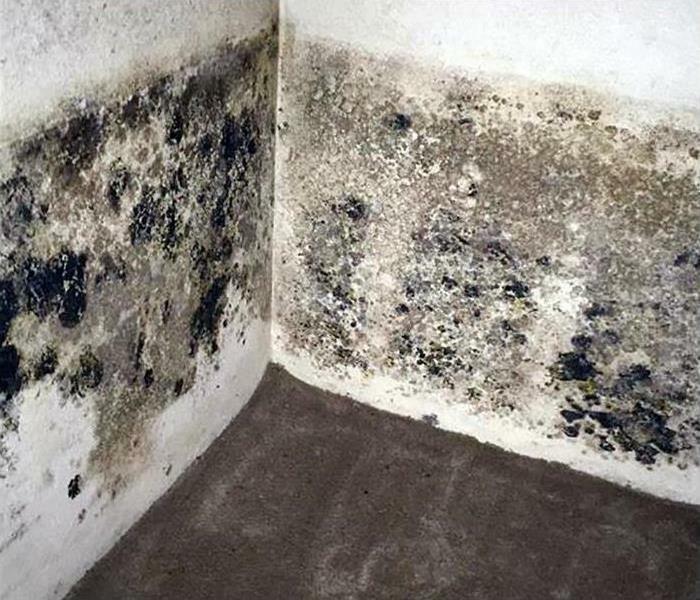 Understanding the significance of severe mold damage is a prerequisite in a professional and complete remediation service. 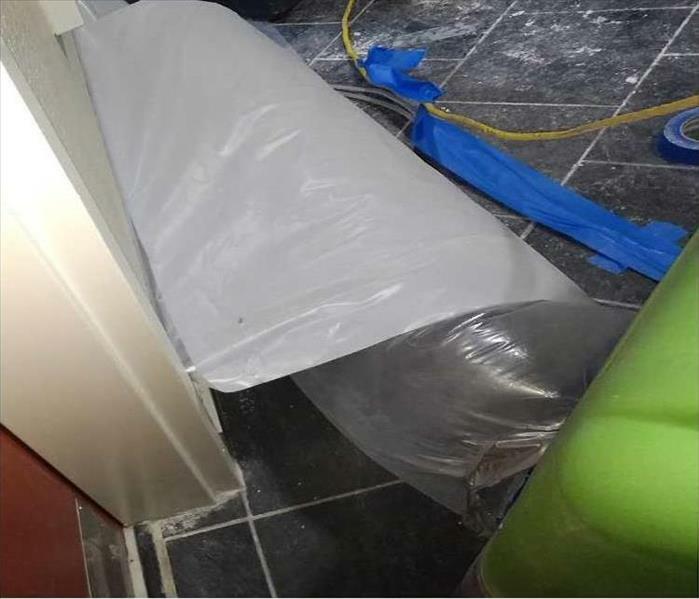 Many home and business owners rely on the track record of SERVPRO of Bel Air / West Hollywood to remediate according to best practices according to the EPA and the IICRC. We are always ready to help. A Commercial building needs fast water removal and drying to minimize disruptions to the enterprise's comings and goings. Whether in Bel Air or the surrounding area, SERVPRO has the expertise to rig the equipment needed for rapid removal. Storm damage in Bel Air can cause extensive water damage requiring the use of the most up to date equipment and often a lot of the equipment is called required. 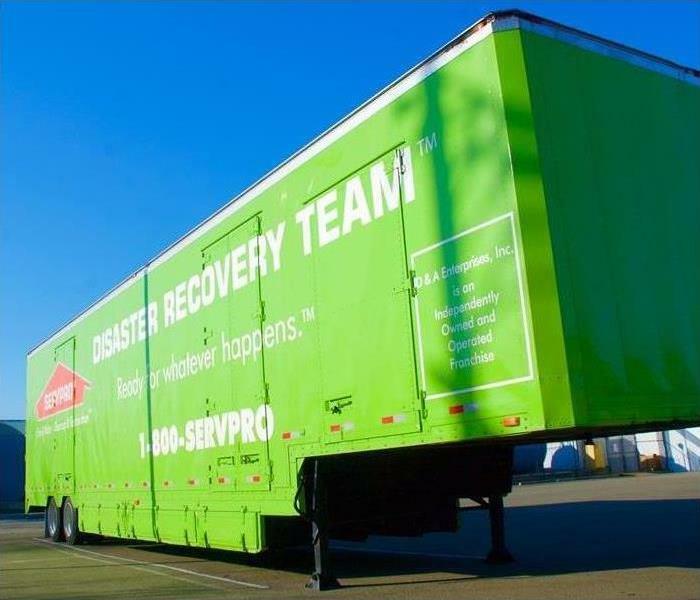 SERVPRO of Bel Air / West Hollywood inventories the latest high-tech water restoration equipment to serve our neighbors when they need help with storm damage. Water that soaks into carpeting frequently causes delamination which separates the carpet nap from the backing. In some cases, it is wiser to remove the wet flooring material to also protect the walls from wicking water leading to more damage. SERVPRO techs can mitigate water damage in West Hollywood homes with a fast and professional service. Mold damage in Bel Air calls for the latest equipment available and the trained personnel to operate that equipment. 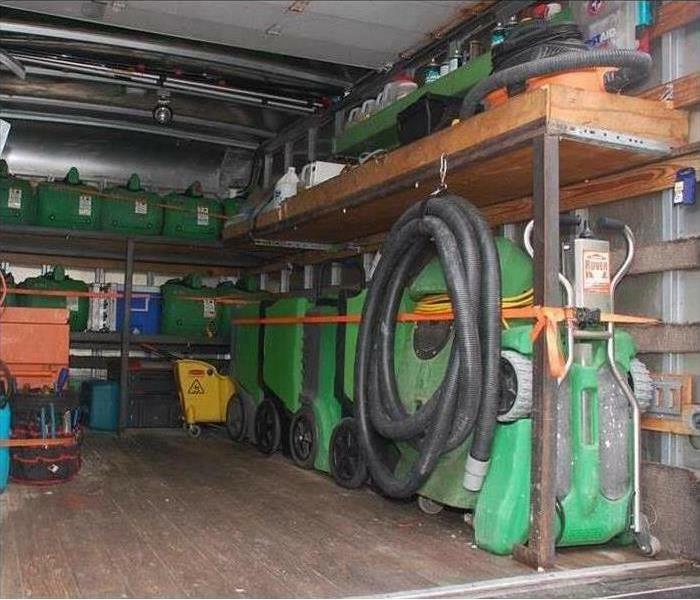 SERVPRO of Bel Air / West Hollywood has an extensive inventory of the most up-to-date high-tech equipment ready for use for mold damage cleanup. We employ industry certified technicians and use time-tested SERVPRO procedures. 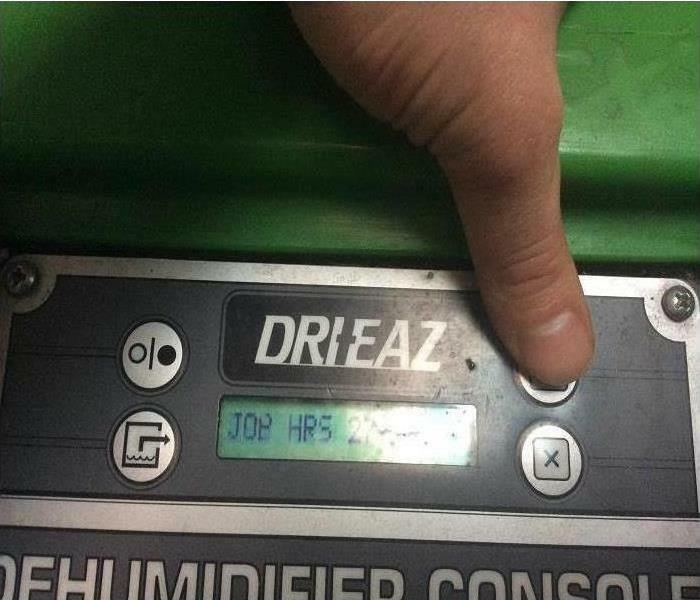 Shown in the photo is a portable dehumidifier used to aid in the drying process of mold remediation projects. 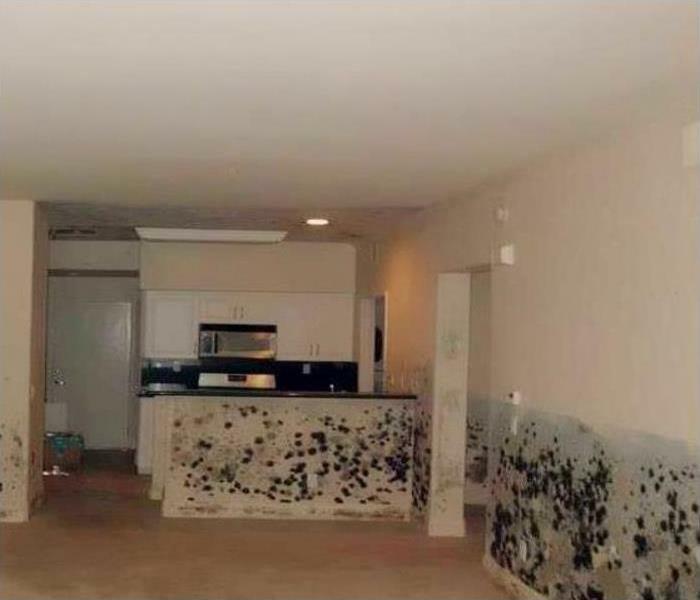 The pulled back area rug shows the dirty deposit left behind after the kitchen fire in a West Hollywood home. SERVPRO CCT carpet cleaning tech can make the floor covering appear as good as new, and smelling even better. 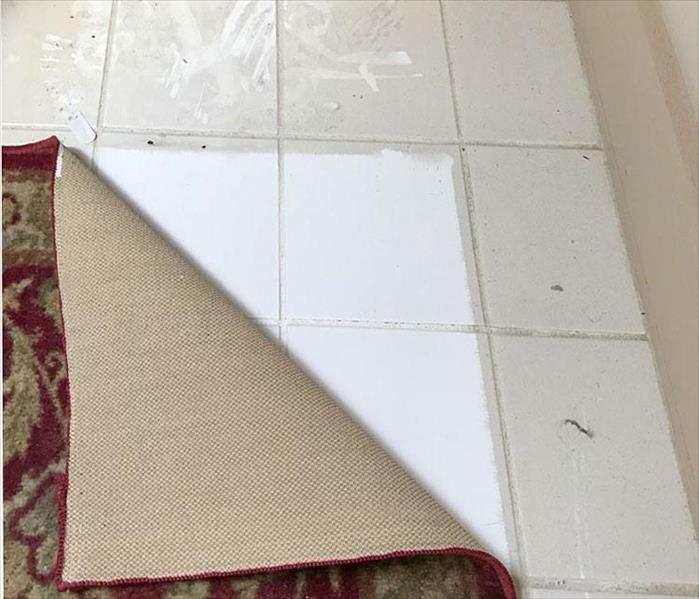 Water damage was suffered at this West Hollywood home when the carpeting shown had become soaked due to a dripping water pipe. 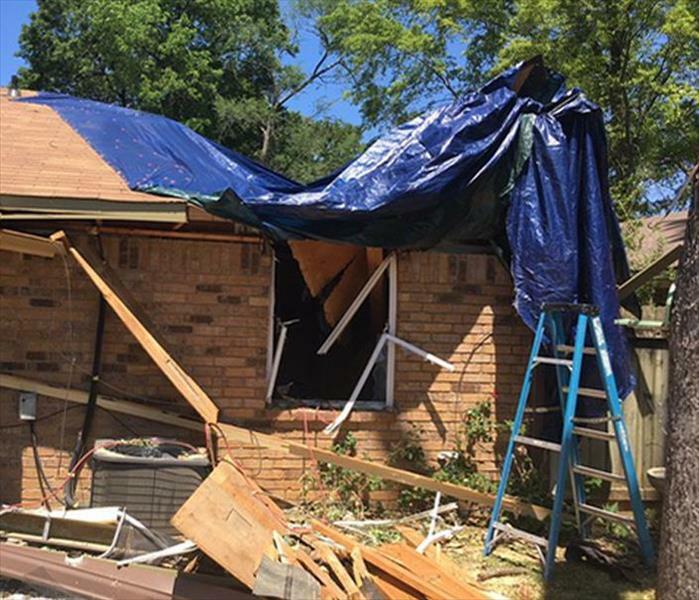 The fast action of the homeowner in calling for help minimized the damage. 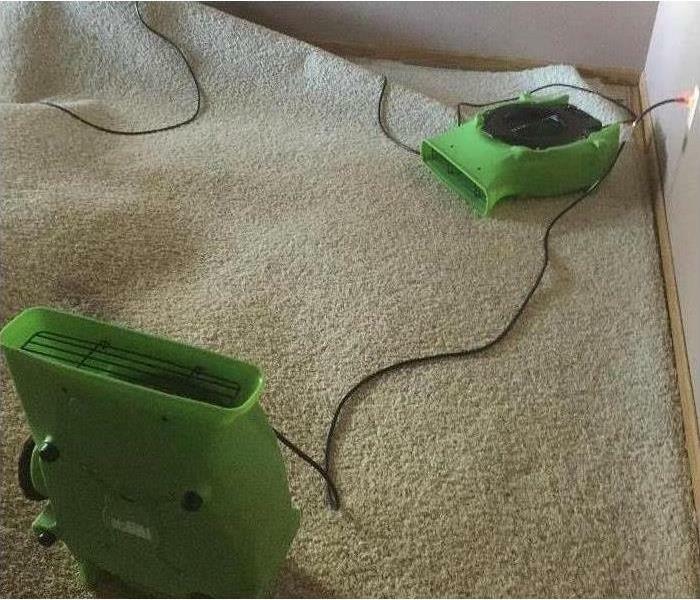 SERVPRO of Bel Air / West Hollywood would lift the carpeting to extract the water and then strategically place dehumidifiers and heated air movers to help dry the carpet and padding. We have the proper tools and the trained technicians to provide quality service. The Bel Air photo depicts what is known in the cleanup and restoration industry as a "flood-cut." 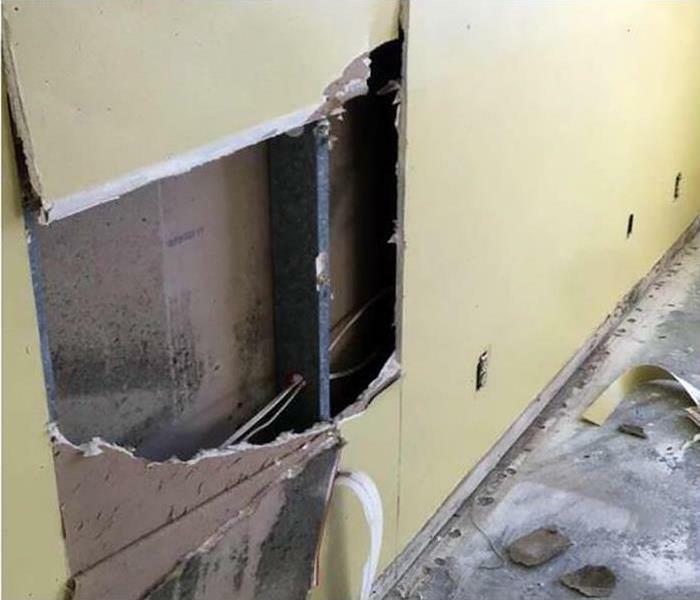 The non-salvageable gypsum board was removed at the four-foot mark to allow for new full panels of drywall to be installed. Less mess and less cost. SERVPRO does it right, the first time. 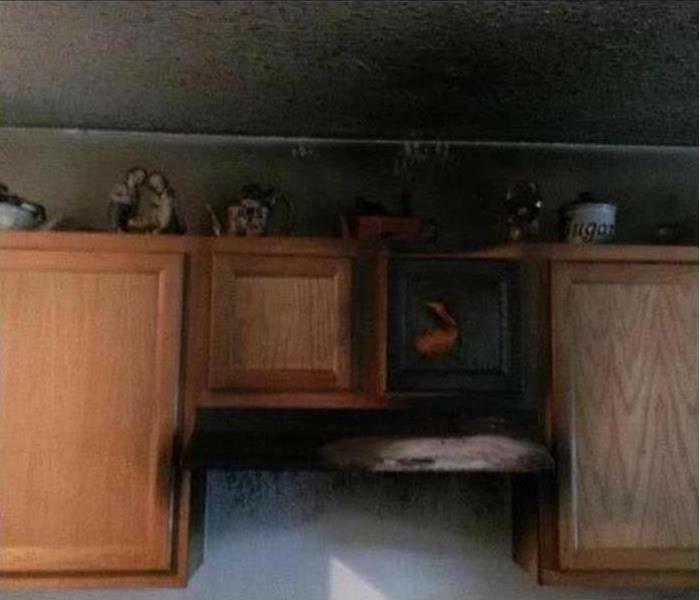 Fire damage to this Bel Air home’s kitchen began with a grease fire on the stove top. The fire was extinguished quickly by the homeowner limiting the damages. While the damage from the fire was limited, there was a lot of soot and smoke damage. The homeowner sought professional help with the cleanup of the greasy residue from the fire. 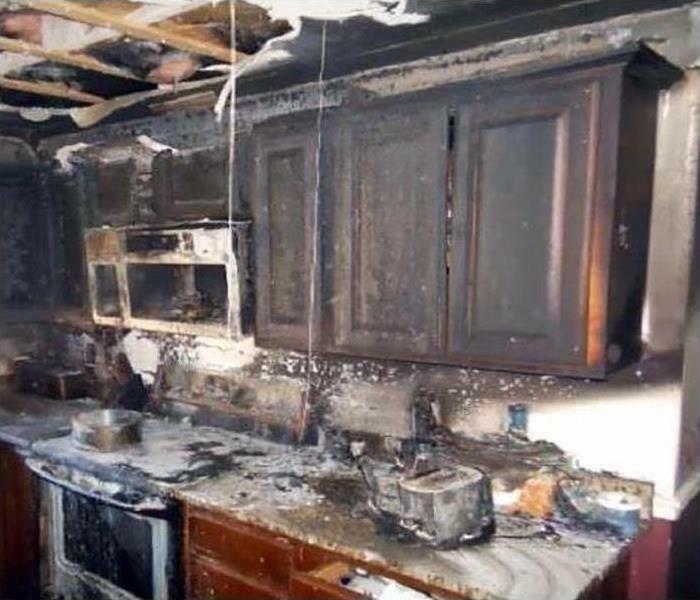 SERVPRO of Bel Air / West Hollywood is well equipped to handle this type of fire damage, and we are available 24/7. 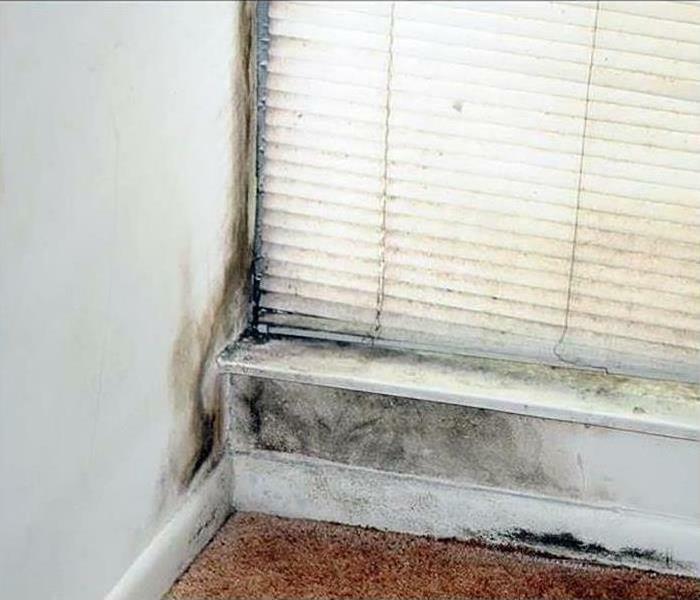 When your business experiences a mold damage emergency, you need the team at SERVPRO. We can handle any size disaster, and we are available 24/7. SERVPRO of Bel Air / West Hollywood has the experience and equipment needed to restore your home to pre-damage condition. The straight-line winds caught the under-eave of this structure in the West Hollywood area and blew out the window and lifted part of the roof. If SERVPRO is called promptly, we can mitigate the damage, cover the roof to keep out the wind and any curious critters and clean up and remove the storm debris. 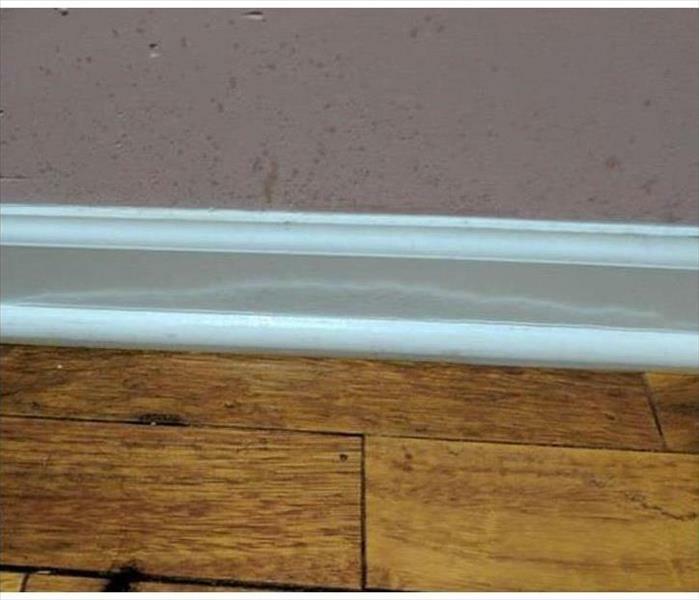 When water seeps down into joints of tongue and groove flooring in the West Hollywood area, special techniques can thwart extensive and expensive water damage restoration. 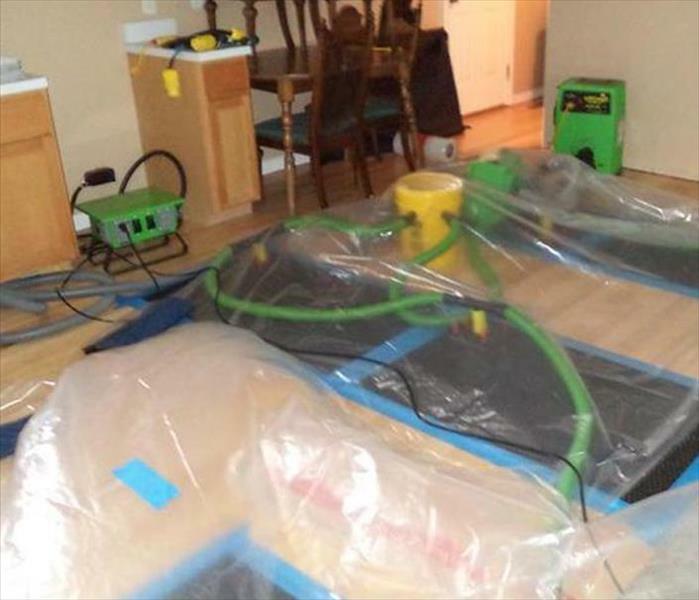 SERVPRO technicians can place a "tent" with drying mats to suction the water out and salvage the planks while also greatly reducing the time for the restoration as opposed to replacing the flooring. Count on us. 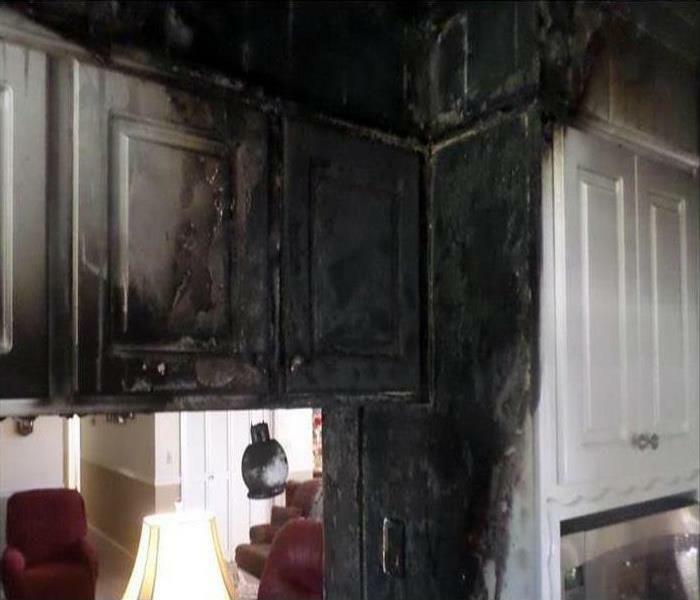 Fire damage to this Bel Air home’s kitchen began on the stove top and very rapidly engulfed the cabinetry and ceiling. It is important to remediate damage such as this quickly to minimize any further damage. SERVPRO of Bel Air / West Hollywood is prepared to respond to our client’s needs 24/7. We possess the expertise, hi-tech equipment, and industry certified technicians to get the job done right. 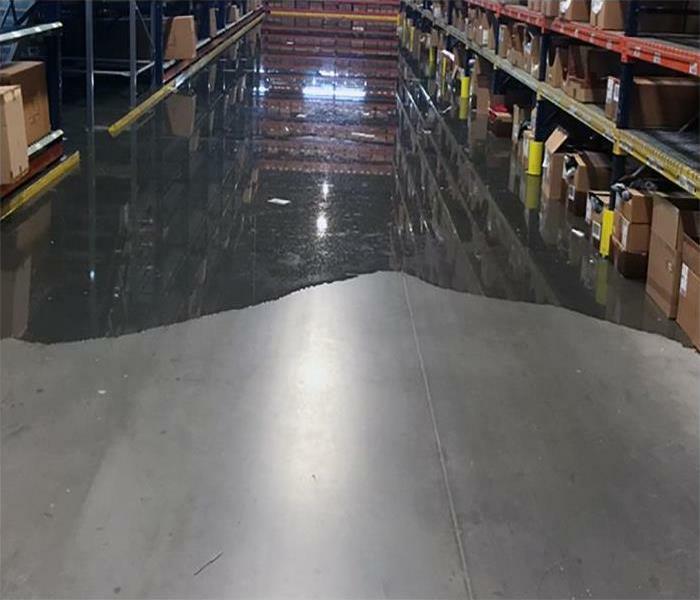 Having your warehouse come to a complete stop due to a water damage emergency is not an ideal situation. Thanks to our fast response time your business will be up and running in no time. We have the equipment, experience, and training to restore your warehouse to pre-damage condition. We’re Faster to Any Size Disaster! The water surged from the storm onto the first floor of this facility in West Hollywood and then receded. Left behind was contaminated groundwater that needed complete removal before a disinfecting microbial spray could be applied to eliminate health hazards. 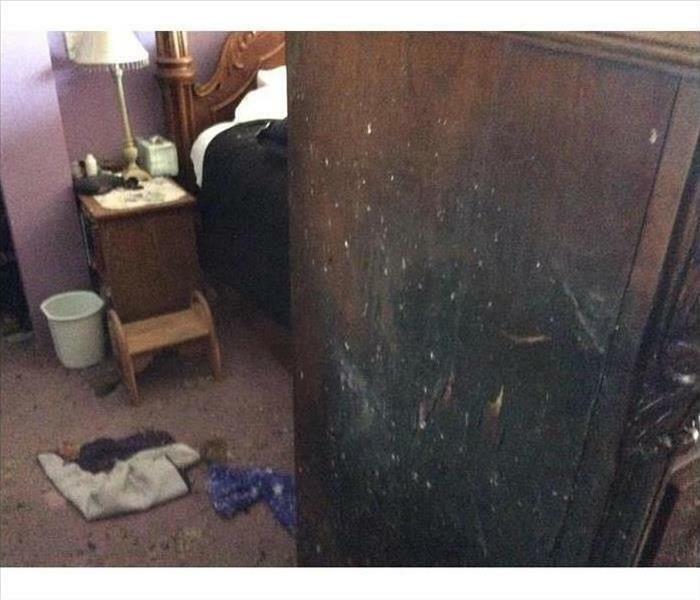 Mold damage at this West Hollywood house was discovered around a window. 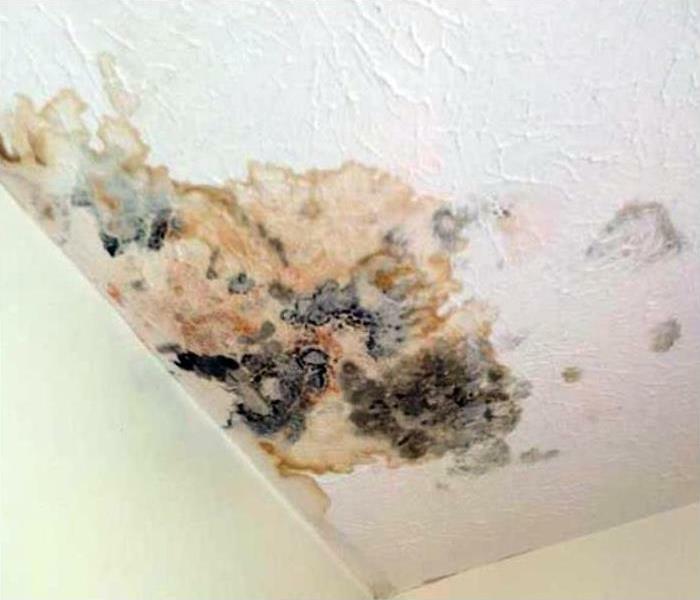 The homeowners had been away for an extended weekend, and the mold developed over a four day period of time. Knowing how fast the mold had developed the homeowners were concerned with how fast the mold colony would expand. They sought professional help. SERVPRO of Bel Air / West Hollywood has all the resources to deal with mold infestations of any kind or size. Commercial grade carpet, strong and as durable as it may be, still requires rapid water removal to prevent water damage from occurring. West Hollywood buildings often call SERVPRO to expedite the water extraction and mitigate water damage. We are always available to help. Fire damage to this Bel Air home left this piece of furniture charred from the heat of the fire. The property owners were convinced the piece would have to be thrown away. SERVPRO of Bel Air / West Hollywood is professional at restoration. One of our mottos is restore rather than replace. We could restore this piece of furniture and save the client the time and expense of shopping for a replacement. 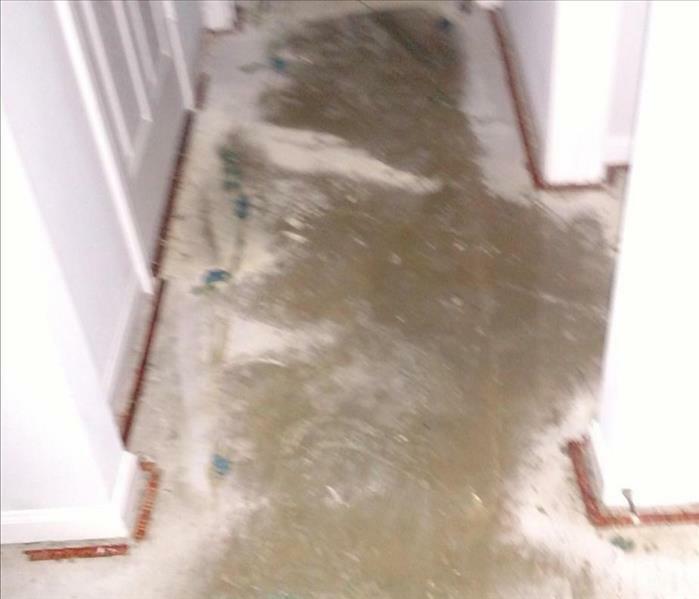 The leak, though not covering a large portion of this hardwood flooring area in Bel Air, was unnoticed in an extra bedroom and the baseboard wicked in the pooling water and become damaged. 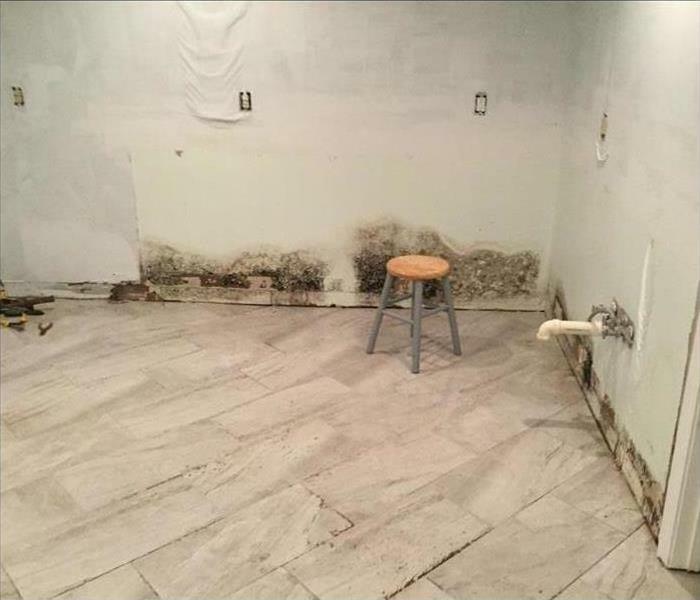 SERVPRO can dry out the damaged areas to prevent further damage and to also protect against the moisture leading to a mold infestation. Storm damage in Bel Air could become a large loss event requiring a lot of commercial equipment to provide proper storm damage restoration services. Large tractor-trailers are stocked and equipped to be sent to a large loss event on a moment’s notice. 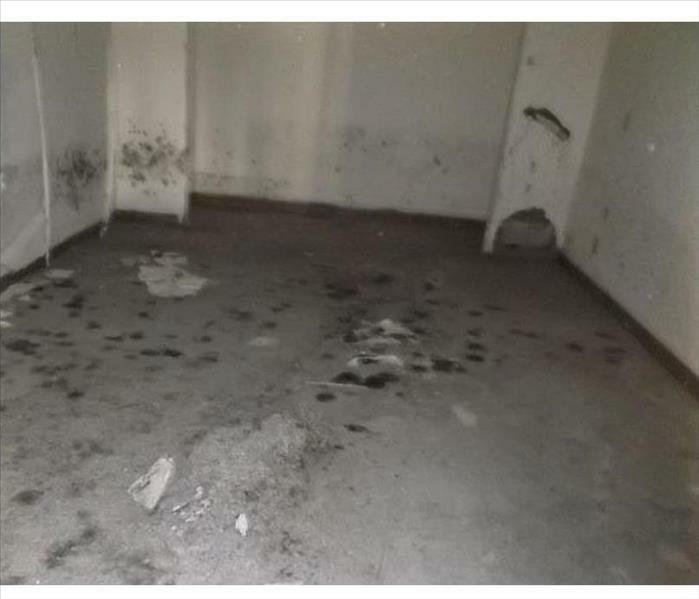 This vacant property in Bel Air was in dire need of mold remediation and cleanup. Moisture accumulated allowing dormant mold spores to proliferate. 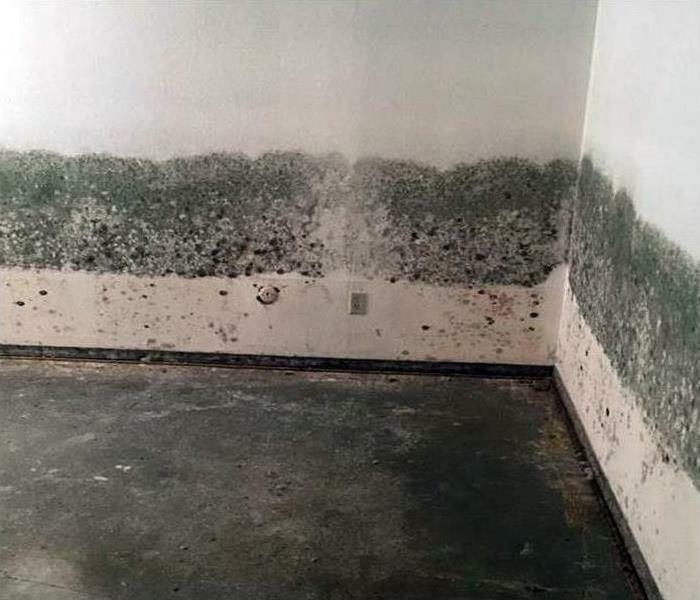 SERVPRO has the skilled technicians to clean up this mold infestation. 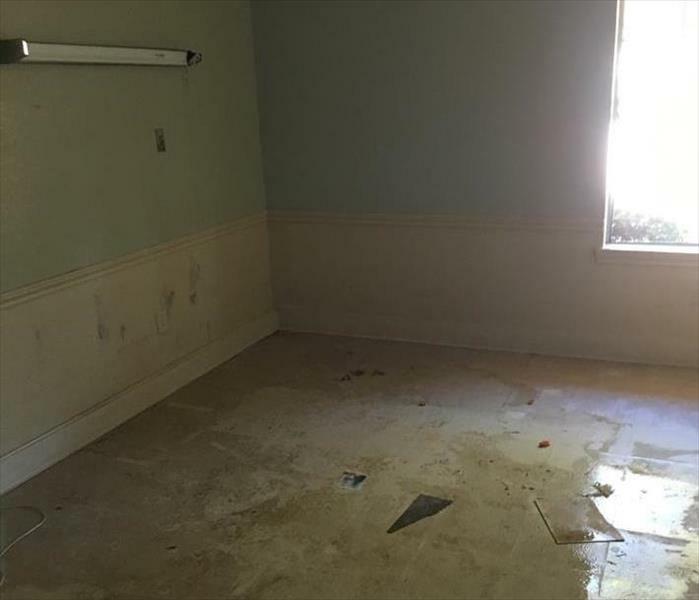 Water damage in Bel Air requires rapid response to minimize damages. 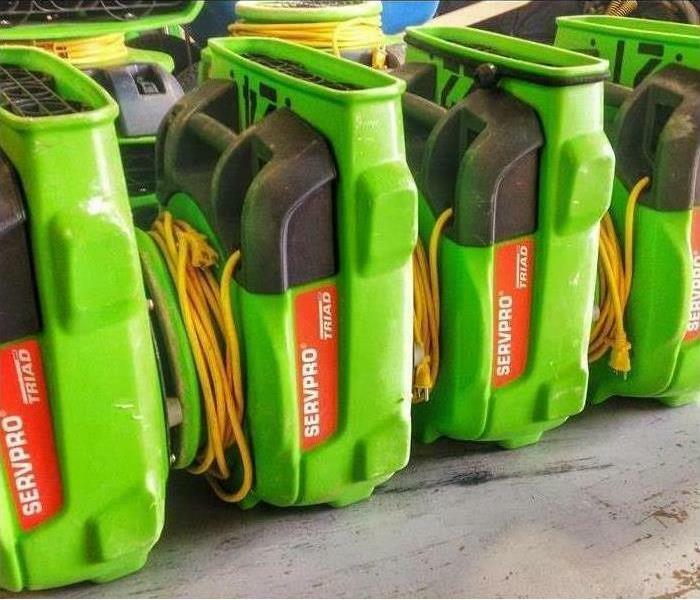 That is why SERVPRO of Bel Air / West Hollywood has trucks stocked with the necessary restoration equipment which can be dispatched on a moment’s notice. Our technicians and equipment are available 24 hours a day, seven days of the week. 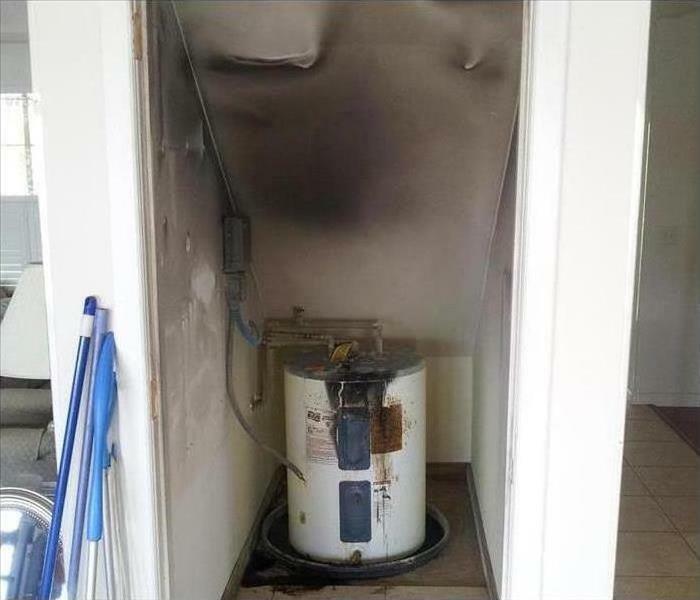 Fire damage at this Bel Air apartment was caused by an electrical fire started in the wiring of this water heater. Soot and smoke damage presented the majority of the restoration work we were asked to perform. We contacted a licensed electrician for wiring repair and then set out to clean up the smoke and soot using SERVPRO products and procedures. 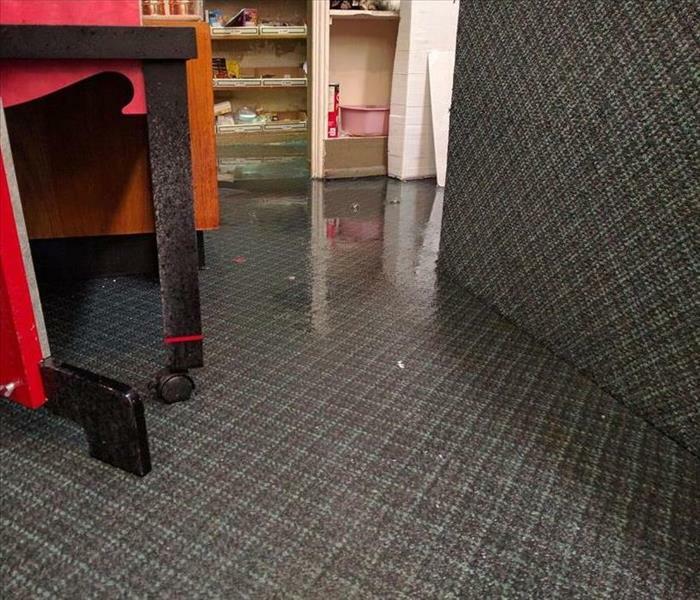 The flooding deposited a fair amount of water on the porcelain tile floor with no damage. However, the water wicked into the baseboards and drywall necessitating a partial tear out of the ruined building materials. 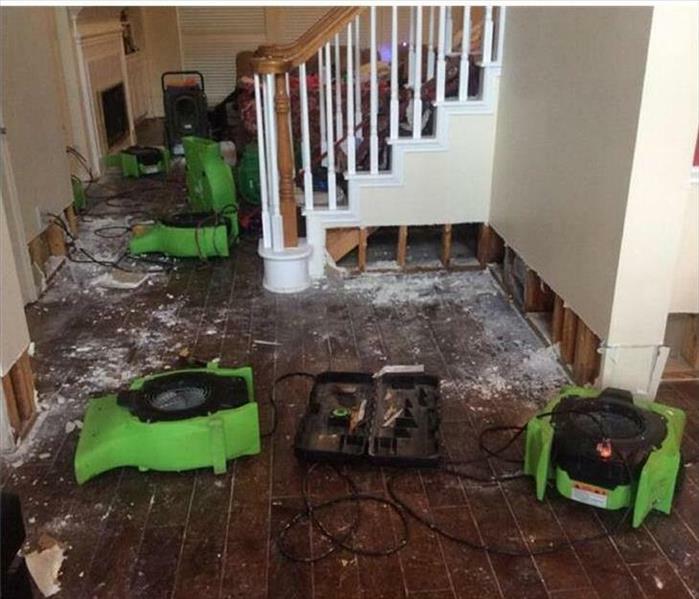 SERVPRO quickly set up air movers and dehumidifiers as shown in this partially completed storm damage to this Hollywood home. 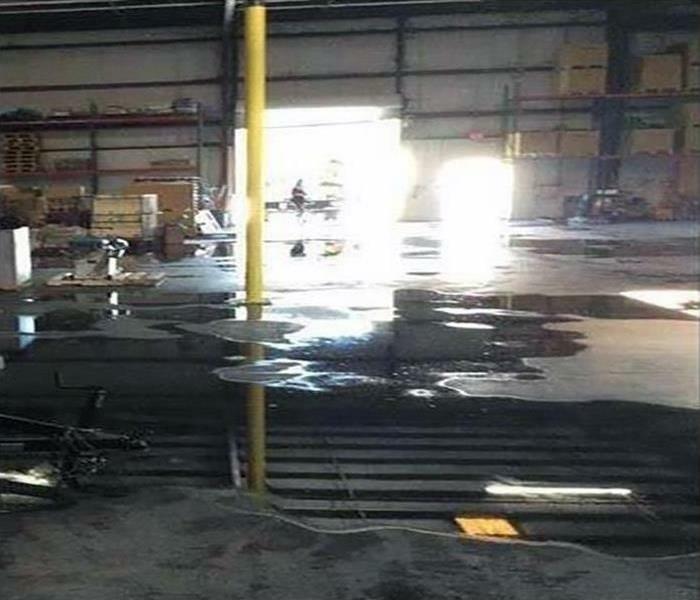 The driving raining storm flooded the floor of this commercial building in West Hollywood causing extensive water damage. 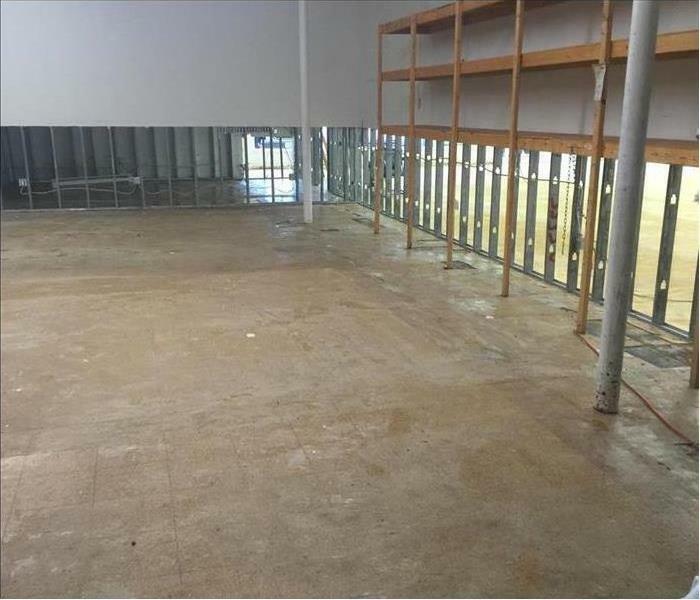 Lower panels of drywall were removed, the floor was dried out, and the site was ready for reconstruction. SERVPRO quickly took care of business for this business. 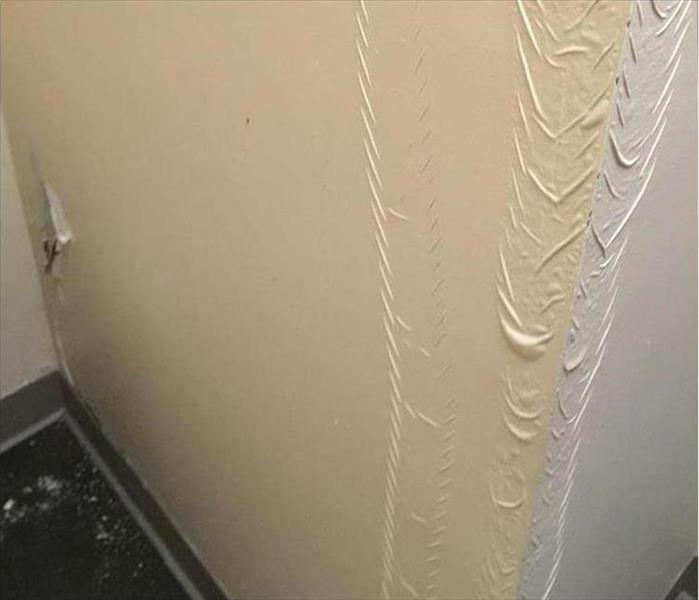 The water leak within this wall shows the rippling effect of water damage on this home in Bel Air. 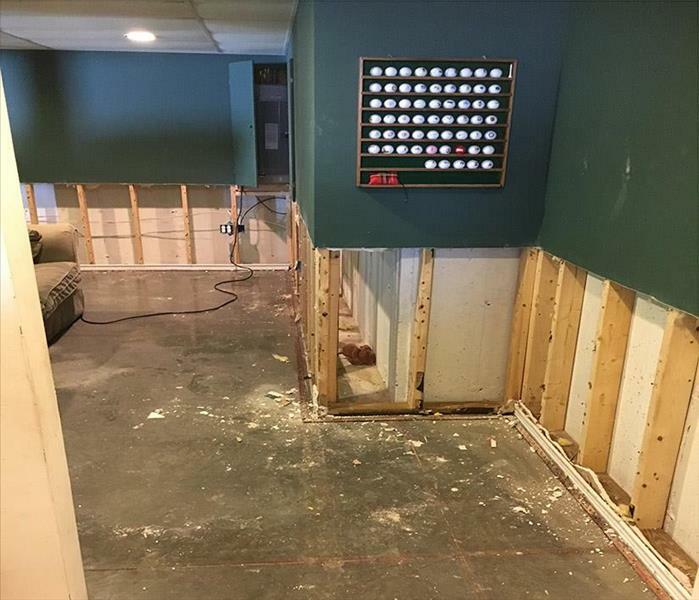 Stopping the source of the water, and then peeling off the ruined outer surface, SERVPRO techs can then begin the drying process to salvage the drywall. 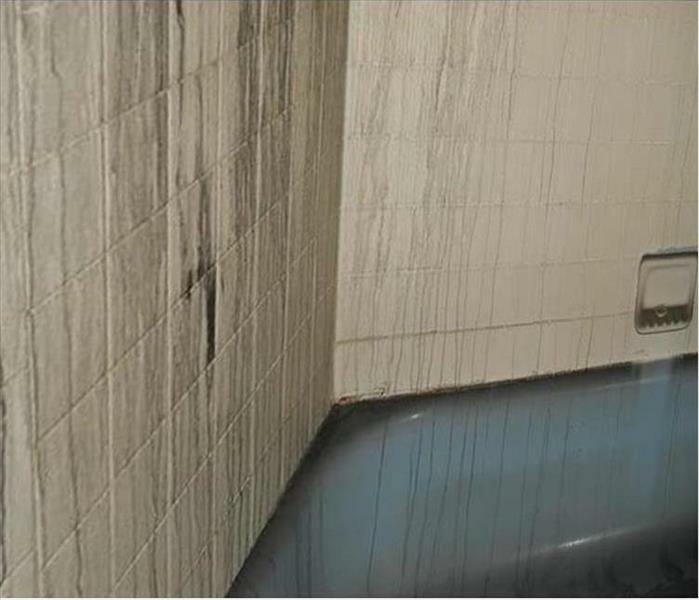 The smoke damage from ignited cosmetics in this West Hollywood home resulted in an oily, sooty residue on the tile and tub. There was not fire damage of significance, so our SERVPRO technicians wiped down the hard surfaces with special dry sponges and then detergents. A deodorizing spray finished this job. 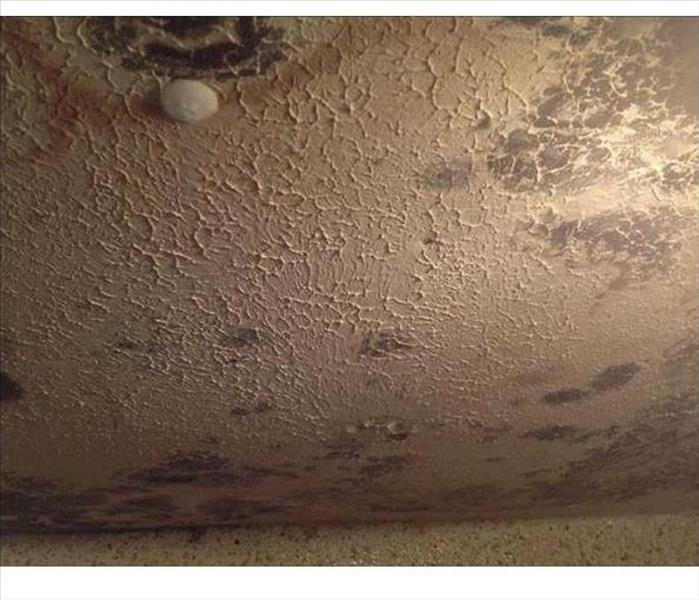 The photo illustrates spreading mold damage to this ceiling in West Hollywood from a slow drip in a supply line. A demolition of this section, along with an application of an antifungal agent, were needed to remediate this mold damage.